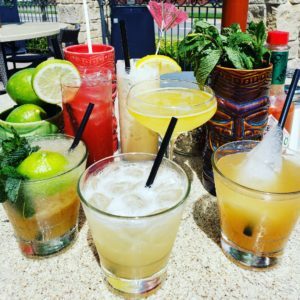 Tiki drinks are making more than a comeback here at Pearls Oyster Bar, they are taking over this summer! We recently launched our own custom Tiki drink menu called TIKI TIKI TIKI and we couldn’t be more excited!! Tiki drinks are their own category of craft cocktails. They are most commonly known as rum-based cocktails based upon tropical cultures originating from Polynesian roots. We have a variety of different Tiki drinks to choose from like the House Special – Pain Killer made with navy rum, nutmeg, house made coconut cream, pineapple juice and orange juice. It is definitely one of my favorites but it also packs a punch! Some of my other favorites are the Mai Tai which is the original Trader Vics Recipe!! Trader Vic’s is a restaurant chain based out of California but founded by a Victor Jules Bergeron, Jr. that created the Polynesian-themed restaurants that don his nickname. He was one of only two people who claim to have invented the Mai Tai. Just a fun fact for ya! Another must try is the Navy Grog. Now, this drink not only tastes good but it is also served with an authentic Navy Grog Ice Cone so it looks cool too! Now is the time to get to Pearls Oyster Bar! Sit back and relax on our award winning patio equipped with misters and huge TVs, order some fresh prawns and/or oysters and indulge in our of our hand-crafted tiki drinks before it’s too late! So good you will feel like you are in Bora Bora….okay maybe not that far but you catch my drift. Hope to see you all out sipping Mai Tais the rest of summer! It’s by far the best way I can think of to beat this Oklahoma heat!